Under the Big Oak Tree: 100 Day Weight Loss Challenge ~ Bring on Week Four! 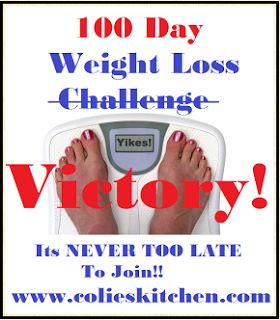 100 Day Weight Loss Challenge ~ Bring on Week Four! I've been meaning to write a check-in post for the 100 Day Weight Loss Challenge, but it's been crazy busy around here. I can hardly believe that three weeks are over already! Week one was a great week for me. I counted calories, drank lots of water and even managed to get in a bit of exercise. At the end of that first week, I recorded a 3.8 lb loss! I was ecstatic! Week two was more of a challenge. The bad points definitely outweighed the good points and the scale reflected those bad days with a 2 lb. gain! I've mentioned before that I tend to snack when I'm stressed and I've been super stressed lately. I haven't been practicing this new healthy lifestyle long enough to break the habit of using food for comfort. As a result, I've been eating all the wrong things and not in moderation either. Week three is not going to be a good scale week. I'm considering keeping off the scale this week. I worry that getting on the scale and seeing another gain (as much as I know I've did nothing to deserve a loss) will cause me to just give up completely. This week, we're on vacation. Really, it's a stay-cation since we pretty much gave up vacations when we took on a mortgage payment six years ago! Either way, we'll enjoy having Joe home with us for a few days! Plus, I tend to be more mindful of what I eat when Joe is home. I don't stuff my face with junk as much when he's here so maybe that will help. I'm also hoping that I'll have more time to exercise this week while he hangs out with Grace. Drink water. Aside from that first week, I don't think I've had even a gallon of water total! I really need to get back to drinking more water. I felt so much better when I was drinking water and cutting way back on the soda. Food. With Joe home this week, we'll be heading to the local produce market where I'll stock up on some healthy snacks. I'll bring it home and arrange several on-the-go containers of fruits and vegetables. I'm considering having the calorie count written on the containers to make it easier to track my calories without having to constantly weigh and measure. I'll be keeping my calories at 1200 per day. Sleep. I'm a night owl. I have such a difficult time getting myself motivated until very late in the day, which often results in me being up until the wee hours of the morning. Since Grace has been getting up bright and early, I've been having a tough time finding any energy at all during the day. This causes me to crave sugar and not really care at all about healthy options and calorie counts. This week, my goal will to be in bed by midnight at the latest and see if that helps me at all. I know my fellow challengers are doing much better with their goals and I am so proud of them! Keep up the great work everyone! Weight loss is very hard work!! It takes time and energy. If I wait until I have time, it will never get done!!! Every morning I make myself a huge glass of ice water!! I no longer keep sugar snacks in the house!! When I feel overwhelmed I have to grab carrot or grapes!!! At first my family complained, BUT, they dont need the snacks either!! They get them when we are out with friends or at school etc! !